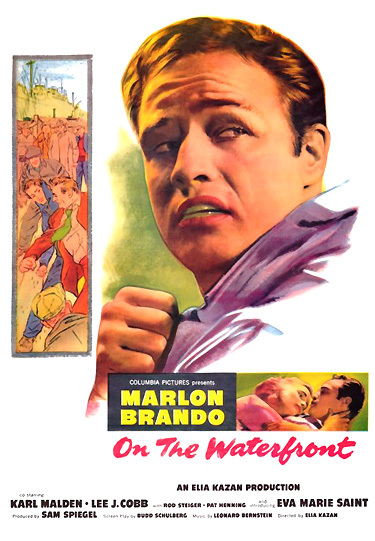 On the Waterfront (1954) is a classic, award-winning, controversial film directed by Elia Kazan - a part drama and part gangster film. The authentic-looking, powerful film is concerned with the problems of trade unionism, corruption and racketeering. And it is set on New York's oppressive waterfront docks, where dock workers struggled for work, dignity, and to make ends meet under the control of hard-knuckled, mob-run labor unions that would force them to submit to daily 'shape-ups' by cruel hiring bosses. To add realism, it was filmed over 36 days on-location in Hoboken, New Jersey (in the cargo holds of ships, workers' slum dwellings, the bars, the littered alleys, and on the rooftops). And some of the labor boss' chief bodyguards/goons in the film (Abe Simon as Barney, Tony Galento as Truck, and Tami Mauriello as Tullio) were real-life, professional ex-heavyweight boxers. The low-budget film brought a depressing and critical, but much-needed message about society's ills to the forefront, and was hailed by most critics. The film's morality tale of corruption ends with its ultimate defeat and the saving of the community by a morally-redeemed martyr (a common man with a conscience). With a naturalistic acting style, Marlon Brando portrayed Terry Malloy, an inarticulate, struggling, brutish hero and small-time, washed-up ex-boxer who took a regrettable fall in the ring. Now an errand boy and 'owned' by the union boss, he is unaware of his own personal power. But eventually because of torment over his actions and his realization of new choices in life, he joins forces with a tough-minded, courageous and crusading priest (Malden) and a loving, angelic blonde woman (Saint), a sister of one of the victims, to seek reform and challenge the mob. The political and criminal context of the film's background and history are extremely important. The similarity between Terry Malloy's whistle-blowing testimony against his own corrupt group paralleled director Elia Kazan's self-justifying admissions before the House Un-American Activities Commission (HUAC) two years earlier (in 1952) as a 'friendly' witness regarding his one-time membership in the Communist party and the naming of others who were sympathizers. Kazan attempted to vindicate himself politically with this semi-autobiographical film - the justification of naming names ('squealing') to expose the evils of corrupt unions, and the suggestion of sympathy advocated for squealers. The film's story was based on New York Sun (now defunct) newspaper reporter Malcolm Johnson's expose, found in a series of 24 articles called Crime on the Waterfront. The series chronicled actual dockside events, labor racketeering in New York's dockyards, and corrupt practices, and won the 1949 Pulitzer Prize for Local Reporting. It revealed rampant bribery, extortions, kickbacks to union officials, payoffs, theft, union-sponsored loan sharks, murder, and the mob's tyrannical influence on New York's waterfront. Originally, Kazan had hired playwright Arthur Miller in 1950 to research the world of longshoremen in Brooklyns Red Hook area (and use material from Johnson's articles), and craft a script for a film to be titled The Hook. It had a similar plot to the 1954 film - the setting of a Brooklyn waterfront with a militant trade unionist hero struggling with mobsters in the dockworkers union. The film was never produced, due to HUAC pressure on Columbia Pictures' studio chief Harry Cohn, who told Miller to change the villains from corrupt and militant union officials and gangsters to evil communists, so it would have a pro-American feel -- but Miller refused and pulled out as screenwriter. The harsh, naturalistic, well-acted and uncompromising film was hugely successful, critically and financially. Its budget of slightly less than $1 million brought in almost $10 million at the box-office. Boris Kaufman's gritty black and white cinematography was singled out as superior, and the film received a phenomenal number of Academy Award nominations - twelve. It won eight Academy Awards including: Best Picture and Director (Kazan), Best Story and Screenplay (Schulberg), Best Actor (Brando), Best Supporting Actress (Saint in her film debut), Best B/W Cinematography (Boris Kaufman), Best B/W Art Direction-Set Decoration (Richard Day), and Best Film Editing (Gene Milford). Three of its other four nominations were supporting acting nods (for a total of four): Best Supporting Actor (Lee J. Cobb, Karl Malden, and Rod Steiger), and Best Scoring (Leonard Bernstein). This was the only film that wasn't a musical for which Leonard Bernstein ever provided the soundtrack. Following the credits, drumbeats accompany a scene at the New York waterfront, where a large ocean liner is docked. The angry gangster union boss, Johnny Friendly (Lee J. Cobb) who callously rules this section of the waterfront, walks up the gangplank with his mobster entourage from the office (shack) of the Longshoreman's local Union. Slow-witted, illiterate waterfront bum Terry Malloy (Marlon Brando) follows behind, surviving as a lackey by running odd jobs and errands for Johnny and doing strong-arm work. Joey, Joe Doyle!...Hey, I got one of your birds. I recognize him by the band...He flew into my coop. You want him? Terry keeps pigeons in coops on his tenement apartment's rooftop, and soon convinces potential informant Joey to meet him on the roof. When he looks up to the rooftop, he sees the dark figures of two men standing there. Instead of joining Joey on the roof, he releases his pigeon into the air, and then walks down the street to a seedy bar, Johnny Friendly's BAR. In front of the corner saloon is Charley Malloy "The Gent" (Rod Steiger), Terry's smartly-dressed older brother and manager. Charley, who works as Johnny Friendly's smart and crooked lawyer and as chief lieutenant, is flanked by two of Friendly's goons. I thought they was gonna talk to him...I thought they was gonna talk to him and get him to dummy up...I figured the worst they was gonna do was lean on him a little bit...Wow! He wasn't a bad kid, that Joey. Maybe he could sing but he couldn't fly! In the street, a shocked crowd gathers around Joey's body. Introduced characters are local parish priest Father Barry (Karl Malden) who delivers the last rites, Joey's father Pop Doyle (John Hamilton), and Joey's fresh-faced sister Edie (Eva Marie Saint). One of the neighbors, Mrs. Collins (Anne Hegira) knows this was no accident: "Same thing happened to my Andy five years ago...(about Joey) He was the only longshoreman that had the guts to talk to them crime investigators ... Everybody knows that." Pop laments that his son didn't follow his advice: "Kept telling him. Don't say nothin'. Keep quiet. You'll live longer." Angered by the senseless murder of the brother she was close to, Edie screams: "I want to know who killed my brother!" In the rough waterfront bar where some of the patrons watch a prizefight on a TV above the bar, Big Mac (James Westerfield) the waterfront hiring boss, brings beer-drinking Johnny Friendly a thick wad of bills, revealing union racketeering, corruption, strong-arm tactics and payoffs: "Here's the cut on the shape-up. Eight hundred and ninety-one men at three bucks a head, that's, uh, - twenty-six seventy-three...We got a banana boat at 46 tomorrow. If we could pull a walk-out, it might mean a few bucks from the shippers. Them bananas go bad in a hurry." Friendly responds sharply: "Ask two G's." A whole network of runners for Friendly's mob are in the bar including a weasel-like banker nicknamed "J.P." Morgan (Barry Macollum) and another conniving mobster named Skins (Fred Gwynne). The only arithmetic he ever got was hearing the referee count up to ten. But Terry is hot-tempered, and reacts harshly to the criticism. Charley excuses his brother's a-typical behavior: "It's just the Joey Doyle thing. You know how he is. He exaggerates the thing. Just too much Marquis of Queensbury. It softens 'em up." When I was sixteen, I had to beg for work in the hold. I didn't work my way up out of there for nuthin'...You know, takin' over this local took a little doin'. There's some pretty rough fellas in the way. They gave me this (he displays an ugly scar on his neck) to remember them by...I got two thousand dues-payin' members in this local - that's $72,000 a year legitimate and when each one of 'em puts in a couple of bucks a day just to make sure they work steady - well, you figure it out. And that's just for openers. We got the fattest piers in the fattest harbor in the world. Everything moves in and out - we take our cut...You don't suppose I can afford to be boxed out of a deal like this, do ya? A deal I sweated and bled for, on account of one lousy little cheese-eater, that Doyle bum, who thinks he can go squealin' to the Crime Commission? Do ya? (pause) Well, DO YA? Terry is given "a present from your Uncle Johnny," a fifty-dollar bill, and then promised a prime work area at the docks at the next morning's shape-up: "Put Terry up in the loft. Number one. Every day. It's nice, easy work, you see. You check in and you goof off on the coffee bags. OK?" Charley reinforces Johnny's kind gesture to his brother with a warning: "Hey, you got a real friend here. Now don't forget it." Boy, they sure got it made, huh? Eatin'. Sleepin'. Flyin' around like crazy. Raisin' gobs of squabs. The faint sound of ship's whistle brings Terry back to reality and he hurries to the docks, where hundreds of men mill around on the pier. [The film effectively uses authentic sounds from its environment: foghorns, ship's whistles, etc. to heighten the realism.] Some of the longshoremen are muttering about the unfortunate Doyle death, because he "couldn't learn to keep his mouth shut." Two of Friendly's goons threaten Timothy J. "Kayo" Dugan (Pat Henning): "Why don't you keep that big mouth of yours shut?...What are you, a wise guy?" Dugan replies: "If I was wise, I wouldn't be no longshoreman for thirty years. I'm poorer now than when I started." Pop Doyle passes the mantle of Joey's jacket to Kayo. I don't know nothin', I ain't seen nothin', I'm not sayin' nothin'. At the 8 am whistle announcing the shape-up at the pier entrance (for 5 gangs and 100 banana carriers), Big Mac calls forward men to work for the day. Terry Malloy is favored and one of the first to be called. From the side, Edie and Father Barry watch, as he tells her: "This is my parish. I don't know how much I can do, but I'll never find out unless I come down here and take a good look for myself." When Big Mac is surrounded by the men, he throws the work tabs over their heads, causing a mad, animalistic, free-for-all scramble. Terry meets the sister of the murdered union worker when he grabs a tab that Edie's father had seen first. When she wrestles with him for the tab, he first teases her, withholding the tab from her. But when he learns she's "Joey Doyle's sister," he gives her the working tab. She gives it to her humiliated father so he can work. Father Barry asks the rejected men who have been denied work: "What do you do now?...Is this all you do, just take it like this?...Huh? What about your union?" He is told that the lawless local union is mob-controlled by Johnny Friendly: "The waterfront's tougher, Father, like it ain't part of America." Father Barry offers the men "the bottom of the church" as a safe haven so that they can discuss their grievances - it can be one place where it's safe to talk. Let me tell you what stooling is. Stooling is when you rat on your friends, the guys you're with. Johnny wants a favor. Don't think about it. Do it. Isn't it simple as one, two, three? One. The working conditions are bad. Two. They're bad because the mob does the hiring. And three. The only way we can break the mob is to stop letting them get away with murder. Now listen. You know who the pistols are. Are you going to keep still until they cut you down one by one? Are ya? There's one thing we've got in this country and that's ways of fightin' back. Gettin' the facts to the public. Testifyin' for what you know is right against what you know is wrong. Now what's ratting to them is telling the truth for you. Now can't you see that? Can't you see that? The meeting is suddenly broken up when rocks shatter the church windows. As Father Barry pairs off the men, Terry suddenly grabs Edie and leads her to safety down a fire escape. Thugs who wield long clubs and baseball bats mercilessly ambush and beat the men. Edie: Which side are you with? Terry: Me? I'm with me, Terry. After he identifies his self-interest, Terry is confronted for a handout by an old rummy, one-armed derelict longshoreman named Mott Murphy (John Heldabrand). The man recognizes Edie and Terry, and accuses him of being there the night Joey was killed. Although bought off by the toss of some coins by Terry, Murphy spitefully calls him a "bum." Terry tells Edie to pay no attention to the "juice-head" who hangs around the neighborhood.